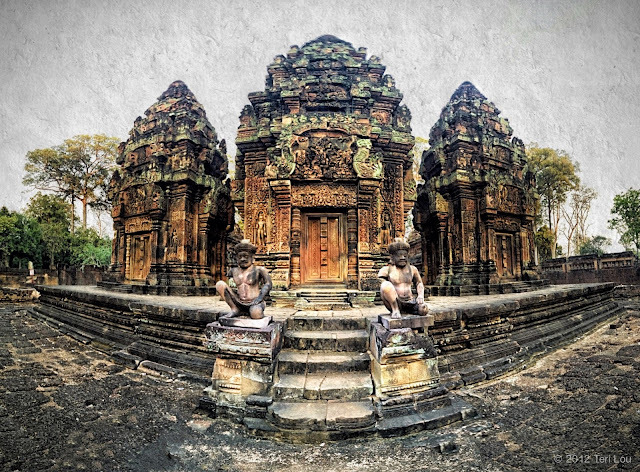 There are many temples in Angkor some stand out more than others. The Banteay Srei was built in the 10 century and "it is said that the reliefs on this temple are so delicate that they could only have been carved by the hand of a woman." It is relatively small compared to the other temples and well worth the 23 mile tuk tuk ride to see its delicate carvings. When I arrived it was just an hour before sunset, I was hoping to catch the 'golden' hour and crossing my fingers for less crowds. However when I arrived tour buses were still coming in and the temple surrounded by 'Chinese New Year' tourists. Trying not to be discouraged I set up my tripod right next to the rope surrounding the refined temples. While capturing a few panos, I was surprised and a bit irritated that some tourist were able to enter the roped area because they were walking into my image. Trying not to be discouraged I moved outside of the moat and captured the reflection of the temple. When I returned inside I once again saw a few tourist inside of the ropes so I asked a guard how I could get inside the ropes too and if I had to pay extra to do so. He politely nodded and walked away leaving me to wonder if he understood my question. I saw him walk up to a older guard and I was hoping he was asking about permission for me to enter. When he reuturn he said, "Yes, $5" I glady paid him for the chance to get a closer look knowing that my 5 buck was going straight into the guards pocket, a tip and a big one for that part of the world.